She wanted to prove a point to her family about whether they would pick up one out-of-place piece of paper. People on Facebook love her for it. It happens in just about any American household. Whether it's "forgetting" to put a toy away or not cleaning up Fido's business because "I didn't see it (right in front of the TV)," some family members just won't do the obvious minor thing that needs to be done to clean the house. One mom did an experiment to prove this to her family and it has since blown up on Facebook, having been shared 293,000 times and on other social media sites. Miranda Crimbring placed a piece of paper on the floor of her bathroom right where everyone could see it in front of the toilet. Underneath it, she folded up a $5 bill -- a surprise for whoever picked up the paper. Crimbring called it the “who will pick up the random piece of trash that they KNOW isn’t supposed to be there” challenge. She posted about it on Facebook Monday night, showing the paper and the money underneath. By that time, Crimbring said the trash had already been there for 48 hours. "Between the kids AND the husband, and MULTIPLE trips in and out of the bathroom, this little piece of heaven may just be in it for the long haul!" Crimbring wrote. 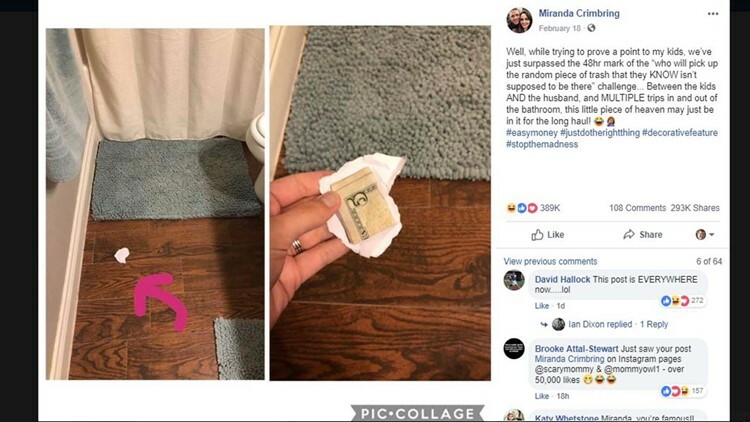 This screen shot taken of a Facebook post by Miranda Crimbring shows how she placed money under a random piece of trash in her bathroom, Feb. 18, 2019. She said she was trying to find out if anyone in her family would pick up the paper. The next morning, the paper was still there -- and apparently had even moved. "Checked the bathroom after the kids brushed their teeth. Paper is still there, though it looks like somebody may have kicked it?" Crimbring wrote. She also noted that some used floss and toilet paper were also on the floor, but not by her. "UPDATE: They are brushing their teeth. As you can see, we’re still going strong, folks!!" Crimbring wrote. "But seriously, just do the right thing. Am I right?!" Finally, on Wednesday night, the ordeal was over, but it happened by accident. "BREAKING: The paper has been PICKED UP!! My daughter threw her dirty clothes on top of it before getting in the tub.. when she went to grab them afterwards, it flipped money side up and kind of slid across the floor. She gasped and then shrieked in surprise saying 'Oh my gosh, this was under there... five dollars!'" Crimbring wrote. But then came the kicker. After picking up the money, Crimbring said her daughter left the paper on the counter. Crimbring said the experiment ended with a long family talk. "I suppose only time will tell if things play out any differently in the future," Crimbring wrote.